To sun-worshiping Incas, the rite of Inti Raymi, a tribute to the Sun God Apu Inti Tayta, doubtless marked the most important date on their calendar. The winter solstice represented both the beginning of a new cycle and the return of the source of life to the Andes. A re-enactment of this solstice celebration takes place every year on June 24 in historic Cusco, the ancient hub of the Inca vast empire. More than 150,000 colorfully clad natives and tourists assemble in the morning at the fabled Coricancha, or Sun Temple, where the Inca (a local resident designated to play the part) delivers an invocation of praise to Father Sun. 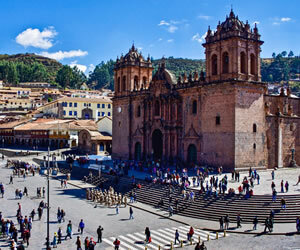 Next, the royal entourage moves to the city main plaza, formerly the Incas great civic square. After a ceremonial reading of the sacred coca leaf to divine the future of the empire, the Inca proceeds to the massive stone walls and zigzagging ramparts of Sacsayhuaman, a cultural treasure situated on a hilltop outside of town. With its commanding view, the ruined fortress remains one of the most astonishing megaliths of the ancient world - a single rock battlement is estimated to weigh more that 300 tons. 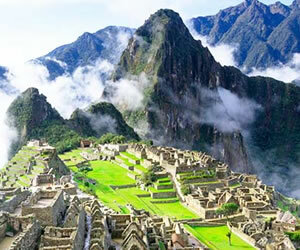 On this occasion, the age-old stronghold is again transformed into the focus of Incan spiritual life. Dressed in full regalia, the honorary Inca delivers his orations in Quechua, the native tongue that is still spoken in Andean highlands. On Sacsayhuaman broad plaza, a fire is rekindled and a llama ritually sacrificed - staged out of consideration for tourists. Sounds of panpipes, drums and blaring horns fill the air. Traditional dancers representing the four corners of the empire dazzle the eye with riotous flashes of red and gold. 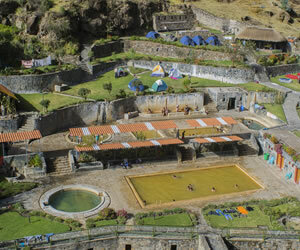 After the Spanish conquest, Inti Raymi was changed to coincide with the Catholic feast of St. John the Baptist. The modern re-creation, based on colonial accounts of the sacred rite, began in the 1940s as a way for Andeans to recapture the spirit and values of their ancestors. Today, Inti Raymi is one of the largest pageants in South America, and a source of great cultural pride to Peruvians. The formal spectacle lasts just four or five hours, but for an entire week Cusco radiates renewed life and energy which recalls the glories of its Incan past. This is perfect option combining traditional tour and the biggest ancestral festival as known as Inti Raymi or The festival of the sun…The tour includes visit to Machu Picchu, the Sacred Valley of the Incas, and entrance to the festival of the Inti Raymi, where you will see the reconstruction of the original festival into the famous fortress of Saqsayhuaman…The Festival of Inti Raymi on June 24 starts in Cusco at Qoricancha (sun temple), continues to the Plaza de Armas, and concludes at Sacsayhuaman with performances, rituals and historical reenactments. The day of all days! Festival of the Sun "Inti Raymi"
At 8am you will be pick up from your hotel and start completely guide tour to lovely festival of the sun in Qoricancha , the festival has three different scenes in three different places , It starts at the Qoricancha Palace placed on Av. El Sol, then we head for main square (Plaza de Armas delCusco) where the second scene will be held and finally it ends with the special scene held in Sacsayhuman ( 2 km from Cusco) where we will go on bus. The Tribunes on Saqsayhuaman. The Central staging ofINTI RAYMIis held in the Sacred main square ofSaqsawaman, over there have been placed the tribunes with capacity for 3,906 people. All the seats are very comfortable for the spectators. The VIP Zone is formed for these 3 tribunes who give a better view of the ceremony. EMUFEC offers other necessary services to attend to theINTI RAYMI, VIP comfortable seats for the spectator, Hygienic Mobil Bathrooms, First Aid Post and police security which allow enjoy this ancestral ceremony. Other Service on Sacsayhuaman EMUFEC offers other necessary services to attend to theINTI RAYMI, VIP comfortable seats for the spectator, Hygienic Mobil Bathrooms, First Aid Post and police security which allow enjoy this ancestral ceremony..How to get to the Inti raymi Scenes.-The scenes at Qoricancha and in main Square are for free , to get to the Sacred main Square in Sacsayhuaman you ought to get the Numbered entrance tickets according to the specified zones shown in the chart above. Cusco celebrates the Inti Raymi with occasion of the winter solstice -the solar new year - for a culture whose main cult object was the god Inti (sun). In time of the Incas it was a religious ceremony, now it is a theatrical representation. However this experience generates a feeling of identity in the city that evokes values and memories that are still in our minds today. 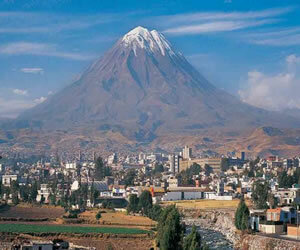 It also brings to mind, a time that lives in the heart of the people of Cusco. This pageant is expressed in the original Quechua language. You will be picked up at your hotel. The celebration starts about 08:00 a.m. at the Temple of the Sun (Koricancha), then continues to the Plaza de Armas (about 10:30 a.m.), and finally at Sacsayhuaman, around 13:00 p.m., we experience the grand pageant. 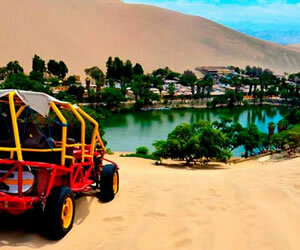 We will provide the transportation, an English-speaking guide, entrance fees and VIP seating, and a box lunch. Late afternoon return to your hotel.